Female pteromalid parasitoids: (a) Muscidifurax raptorellus Girault and Sanders parasitizing a house fly pupa. (b) Spalangia cameroni Perkins on a house fly pupa. (c) Nasonia vitripennis (Walker) on a Sarcophagidae spp. Photos: Lyle Buss, University of Florida. 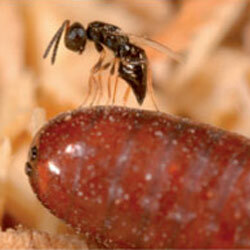 Parasitic wasps may be the answer for horse owners seeking sustainable methods for fly control. A new overview of equine fly management in the latest issue of the Journal of Integrated Pest Management suggests horse owners have been left in the dark about how best to manage flies because research just hasn’t been done. However, one fly-management method that is gaining ground is the use of wasps that are parasitoids of fly pupae. The female wasp inserts an eggs into the fly puparium, and when the egg hatches, the wasp larva eats the fly pupa. The authors conducted research on two wasp species that are sold commercially in the US to see what type of manure they preferred. “In the lab, we found that the Muscidifurax species we tested preferred bovine manure, and the Spalangia species preferred equine manure, so there seems to be some sort of differentiation there, which could impact control on a farm,” said Erika Machtinger, one of the authors. Because of this preference, the ability to identify fly species is important so the correct wasp parasitoid can be used, according to the authors. The authors also provide other advice regarding when the wasps should be released, how often they should be released, and how many should be released. “This is a really good article, and very useful in pointing out some directions, and things that need to be addressed,” said University of Kentucky insect specialist Lee Townsend, who was not involved with the study. The authors noted that biological control using pupal parasitoids had been used in livestock facilities for many years. Husbandry practices in equine farms differed from cattle, swine, and poultry facilities, where most research on pupal parasitoid use had been conducted, they said. They noted there were few guidelines available on the best execution of parasitoid release at equine facilities. They said that little was known about the basic biology of the wasps in equine farm systems. It had the potential to effectively reduce fly populations on equine farms, they said. The overview can be read here. The overview was published as an open-access article.